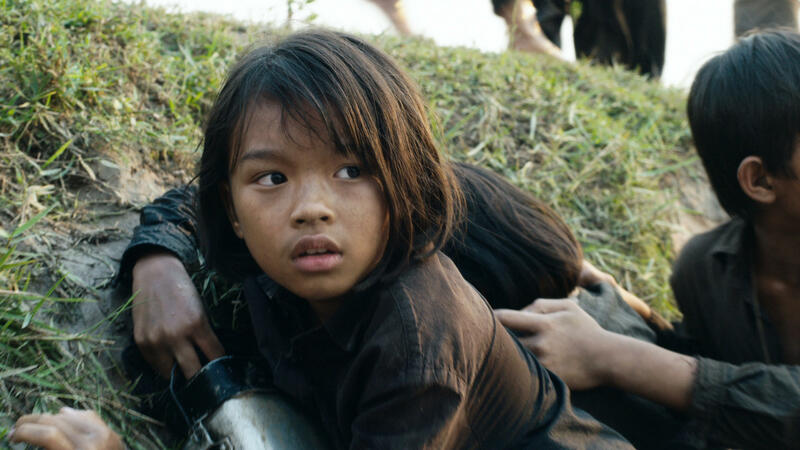 Sareum Srey Moch plays a young Loung Ung in Netflix's First They Killed My Father. First They Killed My Father was directed by Angelina Jolie, and it's based on a memoir by human rights activist Loung Ung. Ung was 5 years old and living with her family in Phnom Penh when the Khmer Rouge arrived and essentially emptied the city. At first, her family managed to stay together, but then her older siblings were sent to a camp for teenagers. Not long after, they also came for her father. Ung's mother decided Ung and her siblings would be safer if they left and pretended to be orphans, so she sent them away. Ung survived the Khmer Rouge along with four of her siblings, whom she reunited with in a refugee camp. Two of them made it to the U.S., and the others stayed in Cambodia. She says her siblings have all seen the film multiple times. "They can't stop watching it. They know that Angie ... and all those who made the film made it with love, and also made it to honor the lives of not only those lost, but also the lives of those who survived." Jolie made the film in Cambodia with a Cambodian cast and crew, and it was shot in Khmer, the Cambodian language. "This is their film," the director says. "I wanted to bring the tools and make it possible. ... It would only be possible if we were allowed to be there, if the people there wanted to participate." Loung Ung: I had no idea where we were going. ... The soldiers, the Khmer Rouge soldiers, came in their trucks with black shirts and pants and carrying guns and grenades on their belts and also wearing huge smiles and screaming to the people that the war was over, the war was over, and to pack as little as we could to sustain us for three days and we could come back after three days. Those were the hopes and the dreams that I held on to. I completely believed that we could come back in three days. And my family and I eventually ended up at various different work camps moving from one work camp to another. And it didn't matter if you were 6 or 60; you worked. You built trenches, you [dug] dams, you grew food to support a war you didn't want, didn't know about. And we had no say in it at all. Ung: This is a little over a year into the Khmer Rouge rule, and information was sparse. We didn't know what was going on; we didn't know what was happening. But we did notice that people were starting to disappear in the village — that a brother over there, or a sister or an uncle or a father were quietly disappearing into the night. So we knew something was up. But my child's heart didn't want to know any of this until the soldiers — two of them-- came to collect my father. And they had, again, guns, and they came in and asked [for] my father by his name and said that they needed him to go and remove an ox cart stuck in the mud. And I remember very clearly that my father went into the hut and talked to my mother, and then how she sobbed and she cried in a way I've never heard her cry before. It was like an animal caged and not knowing where to go next. And then when he came out of the hut, one by one, he picked up my brothers and sister in his arms. And when it was my turn, I had the instinct of heart to wrap my arms around his neck and to rest my face next to his cheek and just knowing that I would never see him again. And he walked off into the sunset with the soldiers on either side of him. Ung: She gathered my brother, Kim, my sister, Chou, myself and another sister, Geak, and told us to leave her. And we didn't want to leave her. I didn't want to leave her. And when I said no, she turned me by my shoulders and pushed me out the door and said, "Get out." It was the moment where I just did not understand the strength and beauty and courage of a mother's heart. ... For years after this, I thought my mother was weak, I thought she didn't love me, I thought she wasn't strong enough to keep me. And I felt abandoned and I wanted to stay with her. And writing it in a child's voice and to go back into that place and imagine what my mother must have gone through — knowing that if she didn't send us away, we might not have made it here today. ... She gave us a fighting chance to survive apart by separating us and pushing us out of the door. ... I never saw her again. Angelina Jolie: I went into Cambodia like many people in America: I didn't know what I should've known. I wasn't educated properly, and I felt very ignorant. And one day I was off work and went for a little walk and bought a $2 book at a street corner, and it was Loung Ung's book. And it was through that book that I really understood what had happened. And I was drawn to the way that she had written it, through the eyes of a child, through the experience of a little girl. But what was interesting, for me, is it was very clear early that the POV wasn't just going to be the technical of where she's at — it was the emotional. Because she's 5, she's very distracted. She doesn't understand what's happening. She doesn't want to understand what's happening. She always looks to Pa: If Pa smiles, it's OK. That's how children gauge what's going on. You don't have a normal scene where you have five people sitting around telling the audience what's going on. So in a way, the audience might be confused a little bit about politics because you're being told by Pa, "It's OK." But you have to check the clues around you and try to see beyond what's she seeing. Jolie: It's very sensitive, and we had to be very conscious of many things. Above all, many of our crew members are survivors of war. So to recreate these things, to have Khmer Rouge soldiers marching over a bridge in an area where people are not used to film ... the amount of awareness you have to do, the amount of talking, the amount of therapists on set — would it be cathartic or would it go badly? And it's to the resilience and the openness of the Cambodian people that it went well, and it was cathartic, and I was honored to witness them make it. Mallory Yu and Jolie Myers produced and edited this interview for broadcast, and Nicole Cohen adapted it for the Web. Cambodia 1975 - the U.S. has been secretly bombing the country for years as part of its war with Vietnam. Then comes the Khmer Rouge, a brutal communist regime whose goal was to deport an entire nation to the countryside and form an agrarian utopia. But that experiment failed. People were forced to work, were tortured, starved and executed. In the end, around a quarter of the country's population, roughly 2 million people, died. Loung Ung survived the Khmer Rouge genocide and wrote about her experience in the book "First They Killed My Father." Now there's a Netflix film that's based on the book and directed by Angelina Jolie. I talked to them both this week, and we started by talking about Angelina Jolie's first trip to Cambodia to film "Tomb Raider" 16 years ago. ANGELINA JOLIE: Well, I went into Cambodia like many people in America. I didn't know what I should have known. I wasn't educated properly, and I felt very ignorant. And one day I was off work and went for a little walk and bought a $2 book on a street corner. And it was Loung's book. And it was through that book that I really understood what had happened, and I was drawn to the way that she'd written it through the eyes of a child, through the experience of a little girl. MCEVERS: Loung, you were 5 years old. You were living with your parents and your six brothers and sisters in the capital Phnom Penh in 1975 when the Khmer Rouge came and basically emptied the city. Where did you think you were going, and where did you and your family end up? LOUNG UNG: I had no idea where we were going. When the soldiers - the Khmer soldiers - came in in their trucks with black shirts and pants and carrying guns and grenades on their belts and also wearing huge smiles and screaming to the people the war was over, the war was over and to pack as little as we could to sustain us for three days, I completely believed that we could come back in three days. And my family and I eventually ended up at various different work camps, moving from one work camp to another. And it didn't matter if you were 6 or 60. You worked. UNIDENTIFIED ACTOR #1: (As character, speaking Khmer). UNG: You built trenches. You digged dams. You grew food to support a war you didn't want, didn't know about. And we had no say in it at all. MCEVERS: And at first your family was able to stay together. That of course changed. Your older siblings - your two brothers and your sister I think were sent away to one camp for teenagers, and then you and the younger siblings stayed with your parents. I wonder if you could tell us about the day that your father - they told that he was going to help them with something. UNG: Yes. This is a little over a year into the Khmer Rouge rule. And we didn't know what was going on. We didn't know what was happening, but we did notice that people were starting to disappear in the village. So we knew something was up. But my child's heart didn't want to know any of this until the soldiers - two of them came to collect my father. And they had, again, guns, and they came in and asked my father for his name - by his name and said that they needed him to go and remove an ox cart stuck in the mud. UNIDENTIFIED ACTOR #2: (As character, speaking Khmer). UNG: And I remember very clearly that my father went into the hut and talked to my mother and then how she sobbed. And she cried in a way I've never heard her cry before. And then when he came out of the hut, one by one, he picked up my brothers and sister in his arms. And when it was my turn, I had the instinct of heart to wrap my arms around his neck and to rest my face next to his cheek and just knowing that I would never see him again. And he walked off into the sunset with the soldiers on either side of him. MCEVERS: I mean this movie relives so much of this, these moments. And you were on the set when these scenes were being shot. What was that like for you? UNG: Well, there were many moments of sadness and anxiety and fear. It would be impossible not to - to see your life and also to realize that it wasn't just you. It's much bigger than you. This was all of our experiences - everybody on the set, all the Cambodians. There were many, many hard times, but the hardest experiences for me were not reliving and watching the war scenes but the very first scene of the family sitting together at a dinner table and just having an absolutely lovely, normal time that we all take for granted. I don't have images. I don't have pictures of times like this with my family. So to see them do it on screen in some way was - it brought them back to life for me. I could see my family sitting like that. MCEVERS: The film is in Khmer. It's the Cambodian language. It's an all-Cambodian cast and crew. You shot it in Cambodia, which is actually not always an easy thing to do. A lot of these films are shot in places like Thailand or elsewhere - films like this. Angelina, I wanted to ask; does that mean that you made this film for Cambodians and not necessarily for a Western audience? JOLIE: Well, for, yes - but more than that, with. I wanted to bring the tools and make it possible. And this is their film, their story. It would only be possible if the people there wanted to participate, and it would only be as good as they decided to give. MCEVERS: 'Cause this is not a part of history that all Cambodians and certainly not all Cambodian officials and leaders like to talk about. I mean was it difficult to get the permission, and how did you do it? JOLIE: ...In an area where people are not used to film, the amount of awareness you have to do, the amount of talking, the amount of therapists on set - would it be cathartic, or would it go badly? And it's to the resilience and the openness of the Cambodian people that it went well. And it was cathartic, and I was honored to witness them make it. MCEVERS: Loung, you and four of your siblings survived the Khmer Rouge. But then after the film ends, you know, your life continued. Two of you made it to the U.S. The others stayed in Cambodia. I guess I wonder how your siblings feel about this film. UNG: They've seen it multiple times. They can't stop watching it. And they love the moments of joy and beauty and grace. I think because of our experience, they went into it fearful of the genocide and the Khmers and the wars. And they came out grateful for the moments of flowers blooming and sisters holding hands. And all those moments made the film very, very uplifting and not at all dark and tragic. But really, it is a story of family and resiliency and the human spirit able to survive and to thrive years after the war. MCEVERS: Loung Ung and Angelina Jolie, thank you both very much. MCEVERS: The film is called "First They Killed My Father." It's out on Netflix this Friday. Transcript provided by NPR, Copyright NPR.